Not only is Walt Disney World’s Animal Kingdom theme park home to exciting and interesting creatures of all kinds; it’s also home to a thousand different ways to experience those creatures. From viewing them in their natural habitats to learning about what it takes to care for them, Animal Kingdom offers Guests unique opportunities to immerse themselves in all the animal world has to offer. And there’s no place inside the park where this is more true than in Africa inside Animal Kingdom. Disney World’s Africa is home to lions, rhinos, elephants, giraffes, gorillas, multiple species of fish and birds, animal shows, animal-themed stage shows, acrobats, dancers and more. Here are 9 things you’ll love and remember about Africa at Disney’s Animal Kingdom should you decide to answer the call of the wild and visit. This 3-hour privately-guided tour at Animal Kingdom takes Guests on an amazing journey to see animals in the Safi River Valley. You’ll get to experience several different adventures—from crossing a rope bridge to riding a safari vehicle over the savanna. During the Wild Africa Trek, you’ll see giraffes, hippopotamuses, crocodiles and more. You’ll also learn about Animal Kingdom’s dedication to conservation and about its efforts in conservation. A professional photographer is also along for the ride and takes photographs throughout the tour. At the end of your tour, you will have access to those photographs as a permanent souvenir. The cost is $189 to $249 per person, and there is no additional charge for the photographer’s services. Valid park admission to Animal Kingdom is also required. To book this tour, call (407) WDW-TOUR. This self-guided walking trail rewards Guests with unique opportunities to view some amazing members of the animal kingdom. The trail begins with the Research Station, and just outside of the station, Guests can visit a free-flight aviary and an aquarium full of vibrantly-colored fish. Further down the trail, Guests can see hippos and then enjoy an unobstructed view of the savanna in an area often referred to as the “Timon Exhibit,” thanks to a friendly family of meerkats who make their home there. As Guests come to the end of a suspension bridge just a short distance down the trail, they reach another “reward” of sorts in the form of the gorilla area, and it’s definitely worth the wait! It helps to have patience—you may have to wait a bit before you see a gorilla. They often hide in the vegetation. After all, this is their home! This exciting 30-minute stage show takes place in the Harambe Theater. For fans of Disney’s The Lion King, this show is a dream come true. The entire cast from the feature film is here for this spectacular show, presented in the round. 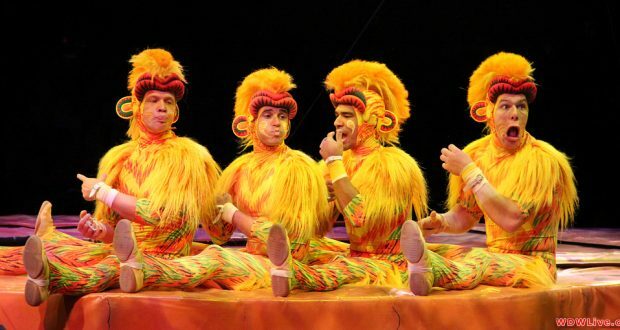 Rather than being simply a re-enactment of the film, it is more of an interpretation of the film that makes use of music, dances, acrobatics and some of the most amazing costumes in all of Animal Kingdom. Be sure to secure a FastPass+ time for this experience and remember to arrive about 45 minutes prior to showtime to get the best seating. Enjoy breakfast, lunch or dinner with Donald, Daisy, Goofy and Mickey in their safari best! African American favorites are served buffet-style; lunch and dinner include couscous, tabbouleh, carved meats, salmon, salads and stews, among other items. The buffet somewhat resembles an open-air market, and dining rooms feature African artifacts, as well as faux maps, signage and notices, which give the restaurant a very “real” feel. Every hour, Mickey and pals dance and lead kids in a mini-parade through the restaurant. Book the Tusker House for your upcoming trip to the parks by accessing the My Disney Experience app or by calling (407) WDW-DINE. This exciting percussion quintet teaches Guests West African dances at the Old Square in front of the Tusker House Restaurant during the morning hours. Showtimes take place between 9:00 a.m. and 1:00 p.m.
Another live entertainment offering in Africa, Burudika is an African pop band that features rhythmic music and encourages the audience to participate. Shows take place at the Old Square between 5:00 p.m. and 10:00 p.m. in front of the Tusker House Restaurant. You’ll think you’ve been transported to the African savanna when you board a rugged safari truck and see free-roaming African animals in their natural habitats. Along the rough and bumpy safari trail, you’ll see giraffes, lions and even white rhinos. Learn about animals of all kinds while on safari from your driver who doubles as your safari guide, cross a rickety bridge and traverse flooded dirt roads. It’s just like being on safari in Africa—only better because you’re at Disney World! Africa is one of the best places to see animals at Disney’s Animal Kingdom. There are many different species to observe as you enjoy the attractions in this part of the park. You’ll see giraffes, gorillas, hippos, okapis, rhinos, elephants, lions and zebras, among other animals. And if you have an affinity for feathered animals, you’ll enjoy Africa for its flamingos and many African birds. This exciting private evening guided tour of Africa begins with a journey into the Harambe Wildlife Reserve to one of the most secluded animal viewing areas in all of the savanna. As part of this experience, Guests will learn from their guides about the animals in the savanna and how they are cared for at Animal Kingdom. They will also enjoy the opportunity to ask questions of their guides and learn all they want to know about the fascinating animals that make the savanna their home. Cost is $169 per person, and Guests must be 8 years old or older to participate. This experience takes place rain or shine, except in the case of severe weather or lightning. To purchase tickets, call (407) WDW-TOUR. Are you feeling a case of safari fever coming on? If so, the best medicine for what ails you is a day at Africa inside Animal Kingdom! What will your African adventure look like?